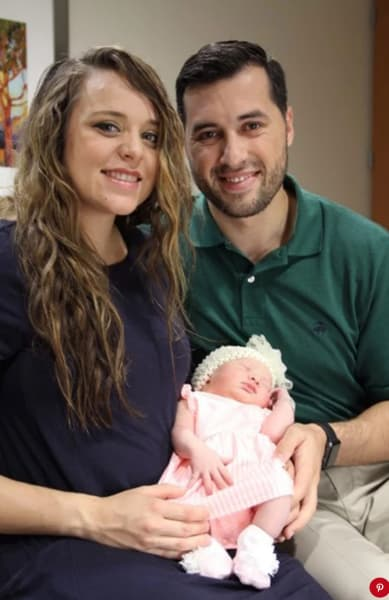 Following months of anticipation and numerous updates on Instagram, Jinger Duggar and husband Jeremy Vuolo welcomed their first child into the world very early on Thursday morning. She was born at 4:37 a.m., according to the very proud and excited father himself. “Felicity weighs 8 lbs and 3 oz, and is 19.5 inches long. Both mom and baby are healthy, doing great, and resting well. The couple got married in November of 2016 and announced in January of this year that they were expecting. The past fourteen months have been the best of our lives as we have had the wonderful privilege of beginning our journey through life together in marriage. We both looked forward to the joys of marriage but neither one of us fully understood just how amazing the start of this journey would be. Truly, the Lord’s mercies are new every morning! Now, the journey has taken an exciting turn: we are expecting our first child. We are praising God for this beautiful gift and ask that you join us in praying for a safe and healthy pregnancy. A few months later, in April, Jinger and Jeremy revealed that they were having a girl. “We could not be more excited and are eagerly anticipating meeting our little lady this Summer. 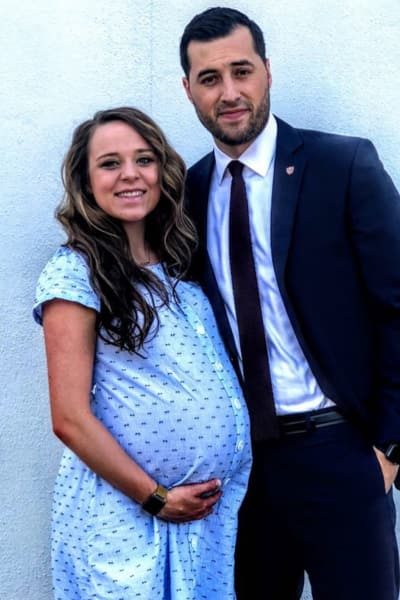 Just a few days ago, Jinger posted her final baby bump photo on social media, making it clear to followers that she was so very close to popping. 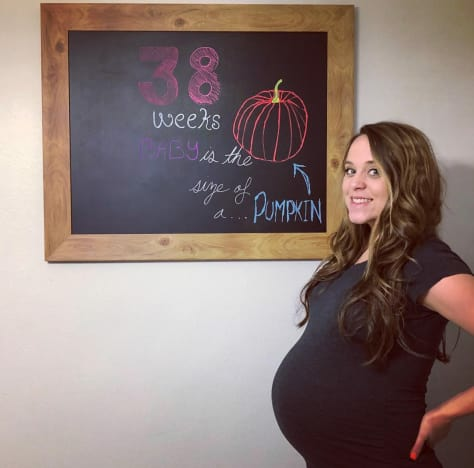 Previous to this update, Duggar had posed with a chalkboard and her growing stomach on a near-weekly basis, keeping fans apprised of her progress by comparing the size of her fetus to cantaloupes, bell peppers and pumpkins. Jinger seemed to have a relatively calm and healthy pregnancy overall. She’s been catching up on her sleep prior to likely not getting any for awhile. Duggar’s sister, Joy-Anna, welcomed a son named Gideon with husband Austin Forsyth in February of this year. Also, their sister-in-law, Kendra, gave birth to a son named Garrett David with husband Joseph Duggar on June 8. You’ll be able to learn plenty more about Jinger’s pregnancy and first child when Counting On returns with new episodes in July 30 at 9/8c. Counting On Trailer: THREE Duggar Babies … and a Wedding! Looks quite quite the adventurous time ahead for all. 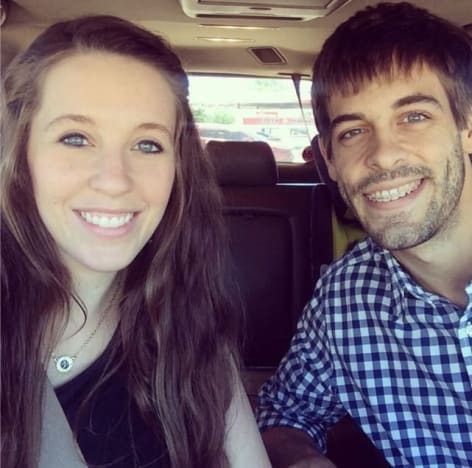 CONGRATULATIONS TO JINGER AND JEREMY! Your baby is absolutely adorable and we wish you the best of luck as parents. Mehgan James: Rob Kardashian’s New Girlfriend HATED ON By His Sisters! Next story American Horror Story Season 8: Chilling First Details Revealed! Previous story Big Brother Recap: Did Sam Bledsoe Use Her Secret Power?